The Duke University Chronicle, the independent daily newspaper of the Blue Devils, was bedeviled by its lack of a centralized production system. Over 100 fulltime staff and student volunteers produced the daily by moving articles and layouts through a folder-based system. Staff editors, designers, and production people were constantly running afoul of whether they were working on the correct version of a file and at the right stage. In addition, copy fitting was difficult since reporters and editors wrote using an application that had no links to the papers page layout program, InDesign. As a result, issue closes went regularly into overtime as students were pulling all-nighters to release the pages to the printer. 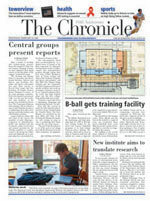 The Chronicle needed a slam-dunk to streamline production and allow staff to close the paper earlier in the evening. It needed a system that could track the latest versions of the files, keep revisions, and allow for interactivity between the layout makeup editors and the writers. The Chronicle selected the K4 Publishing System to satisfy staffs requirements for editorial and production workflow. Chronicle management hired DPCI, a full-service publishing technology firm, to design and implement the new system. DPCI met with Chronicle staff and over Summer Break implemented K4 to meet the daily publications needs. Additionally, DPCI helped the Chronicle streamline workflow, train end users, and support staff in the first few weeks of production. Further, DPCI helped The Chronicle with other challenges like selecting the right hardware and bringing on-line a new server-based font management system. DPCI worked with The Chronicle advertising staff to help the paper implement a streamlined digital ad submission process. The first night The Chronicle went live with K4 the paper was put to bed hours sooner than normal. Over the first two months, the paper released to printer earlier and earlier. That was good news indeed for some sleep-deprived budding journalists. In the words of Jonathan Angier, General Manager of Duke's Chronicle: "Our work with DPCI has freed us to publish more productively. Their business analysis and technical solutions, based on the K4 platform, allows us to continue the development of our publishing program and prepare for future growth." DPCI certainly can't boast that it has helped the Blue Devils get to the Final Four in any given year, but we are fairly confident that The Chronicle will be able to report on its team successes earlier and more effectively than ever before. DPCI: Helping Universities publish better newspapers more quickly, so students can get to bed earlier.